Geochemical and geochronological studies have been carry out on the leucosomes of Yaoundé series with the aims to identify the magma sources and to indicate their production periods and emplacement within the formations of the Pan-African North-Equatorial Fold Belt (PANEFB) in Cameroon. The Yaoundé series belongs to the Southern domain of the PANEFB and it is composed of migmatites in which two types of granitic leucosomes (in situ leucosomes and injected leucosomes) have been distinguished. These rocks display characteristic of calc-alkaline (in situ leucosomes) and high-K calc-alkaline to shoshonitic series (injected leucosomes). All the rocks are peraluminous with in situ leucosomes conform to S-type and injected leucosomes conform to Iand S-type granitoids. Major and trace elements composition reveal that in situ leucosomes derived from the partial melting of the host metapelite whereas injected leucosomes derived from the melting of metagreywacke. These sources are similar to those of granitoids from central and northern domains of the PANEFB. Th-U-Pb dating by electron microprobe (EMP) and LA-ICP-MS U-Pb dating on zircon have been used to constraints the melting event and emplacement of leucosomes in Yaoundé series. Th-U-Pb monazite dating, undertaken in two samples of leucosomes, gives two groups of monazite ages. The older group gives an age of 658 Ma whereas the age of younger group is 592 Ma. U-Pb dating of zircons from the leucosomes reveals a Pan-African age ranging from 626 to 654 Ma whereas zircons from metapelitic host rock reveal the overprinting of an early Pan-African event 911 - 1127 Ma on Palaeoproterozoic (2127 Ma) inheritance. 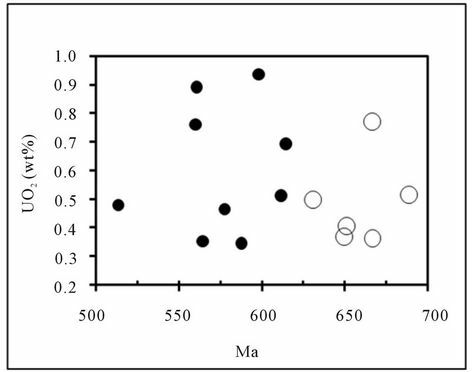 These data clearly indicate that the host rocks of leucosomes of Yaoundé series have been firstly metamorphosed during Tonien-Stenien period (911 - 1127 Ma) and reveal the existence of extended unique melting event (592 and 658 Ma) in the Yaoundé series which is contemporaneous with the magmatism responsible for the emplacement of granitoids in the other domains of the PANEFB. Peraluminous magmatism is largely reported in the collisional belt. However, this magmatism is also observed, but in least proportion, in the passive margin setting where it is expressed by volcanic tuffs [1,2]. The study of metamorphic and igneous rocks provides important information on the magmatic processes which took place in the continental lithosphere, especially in the collisional belt. In this type of orogeny, there is a strong relation between metamorphism, deformation, melting and/or magmatism. The study of the granitic melt is of fundamental importance for the understanding of the main processes of genesis and evolution of the continental crust and notably of the palingenesis. Till date, peraluminous magmatism in Cameroon is only reported in the northern and the central domains of the Pan-African North-Equatorial Fold Belt (PANEFB). The study of the leucosomes in the migmatites of Yaoundé in the southern domain of the PANEFB has revealed their granitic composition and their peraluminous affinity. The ubiquity of the magmatism in the PANEFB, which spreads more than 500 km, from the northern domain to the southern domain, can be assigns either to the existence of a unique melting event along the belt, or to distinct melting episodes. Indeed, the uniqueness of metamorphic and tectonic phenomena throughout the PANEFB was demonstrated by many authors [3-5]. This paper presents the results of geochemical and geochronological studies of the leucosomes of the southern domain of the Pan-African North-Equatorial Fold Belt. 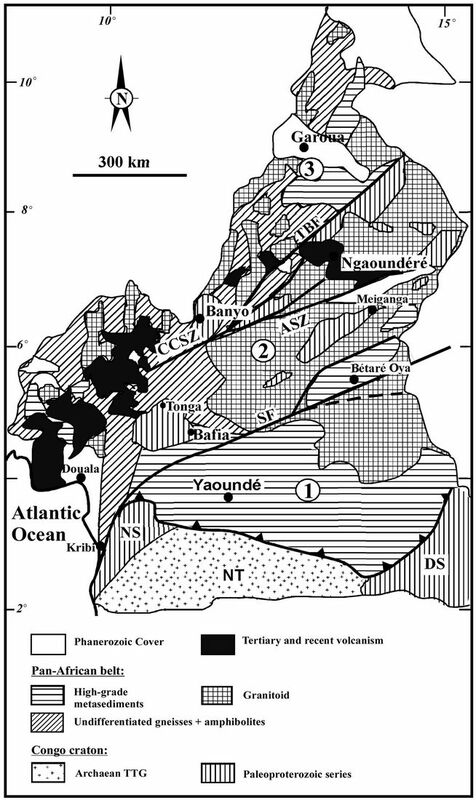 These results, compared to those obtained on the granitoids of the northern and the central domains, allow us 1) to identify the magma sources all over the PanAfrican North-Equatorial Fold Belt and 2) to indicate their production periods (ages) and emplacement within the formations of the PANEFB in Cameroon. The Yaoundé series belongs to the Southern domain of the Pan-African North-Equatorial fold belt and is situated in the northern edge of the Congo craton (Figure 1). It is composed of intensely deformed metasedimentary and meta-igneous rocks . The metasedimentary rocks are made up of chlorite schist, garnet and/or kyanite bearing micaschist and garnet and kyanite bearing gneisses. The protoliths of these rocks are shale and greywacke deposited in an intracontinental rift context or thinned margin [6,7]. These metasediments are locally intruded by diorite and/or granodiorite and metamorphosed under HPHT conditions (T = 750˚C - 800˚C, P = 0.9 - 1.3 GPa; [6, 8]) at 620 ± 10 Ma (U-Pb age on zircon; ) or at 616 Ma (U-Pb age on zircon and Sm-Nd; ) and or between 613 ± 33Ma and 586 ± 15Ma (Th-U-Pb age on monazite; ). Figure 1. (a) Location map of the study area; (b) Geological map of Yaoundé group (adapted from ). 1: Congo Craton; 2: Mbalmayo series; 3 and 4: Yaoundé series (Garnet micaschist and migmatitic gneisses, respectively); 5: Sampling site. pressure granulite-facies assemblage and the beginning of partial melting; 2) the D2 event is a compressionnal phase marked by the intrusion of mafic rocks, the in situ partial melting, the injection of the quartzo-feldspathic melt along the C2 shear plane and by a southward thrusting of the rocks of this series onto the Archean Congo Craton. The migmatisation develops mainly during this second phase. Figure 2. Geological map of Cameroon (adapted from ) showing the localization of the Yaoundé area and the three main lithotectonic domains of PANEFB: 1) Southern domain; 2) Central domain; 3) Northern domain. CCSZ: Central Cameroon Shear Zone); SF: Sanaga Fault; TBF: Tibati Banyo Fault; NT: Ntem Complex; DS: Dja Series; NS: Nyong Series. 1) The northern domain, with polyphase and polycyclic evolution [14-18], consists of metavolcanite of tholeiitic and alkaline affinities associated with metasediments (Poli series) and widespread 630 - 660 Ma calc-alkaline orthogneisses interpreted as major episode of accretion . These orthogneisses contain granulitic relics of Palaeoproterozoic age (2100 Ma, ). 2) The central domain consists of an assembly of fragments of Paleoproterozoic continental crust recristallised under high-grade granulite facies (850˚C - 900˚C, 10 - 12 Kb) at ca. 2100 Ma [3,19,20] intruded by widespread Pan-African syntectonic granitoids. These granitoids have high-K calc-alkaline to shoshonitic affinities. They are either S-type peraluminous granite , or I-type metaluminous to weakly peraluminous granite [21-24] and are derived from the partial melting of the metapelite or metagreywacke sources. Their emplacement age ranges from 558 Ma to 621 Ma [19,21,24-26]. Samples were collected from fresh outcrops in quarries around Yaoundé. Leucosomes were separated from each other in a set of centimeter-thick slabs cut perpendicular to the foliation of the samples. Major elements, as well as Rb, Sr, Zr, Nb, and Y, were determined by X-ray fluorescence (XRF) spectrometry at the University of Nancy I using the procedure outlined by Govindaraju & Montanari ; Th, U and rare earth elements (REE) were determined by inductively coupled plasma emission spectrometry (ICP-ES) and by absorption spectrometry at CRPG, Nancy . Analytical uncertainties are estimated at 2% for major elements, and at 5% or 10% for trace element concentrations higher or lower than 20 ppm respectively. Precision for REE is 5% when chondrite-normalized concentrations are >10 and 10% when there are lower. Samples are normalized to chondrite using the factors presented by Jahn et al. . 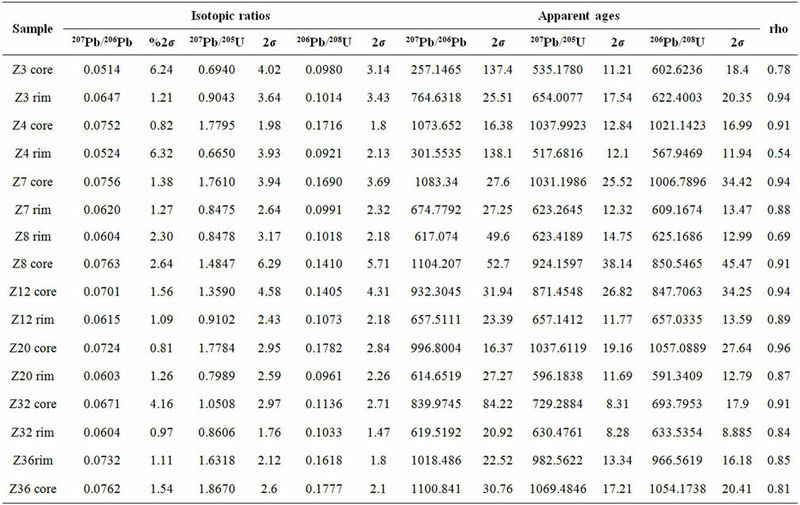 Analysis of Th, U and Pb for calculation of monazite model ages, as well as for Ca, Si, LREE and Y for corrections and evaluation of the mineral chemistry were carried out on a JEOL JXA 8200 (Chair of Mineralogy, University of Erlangen-Nürnberg) at 20 kV, 100 nA, and a beam size of 5 μm . 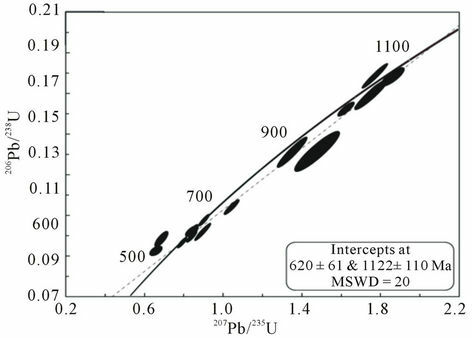 M1 lines of Th and Pb and the M1 lines for U of a PETH crystal were selected for analysis. 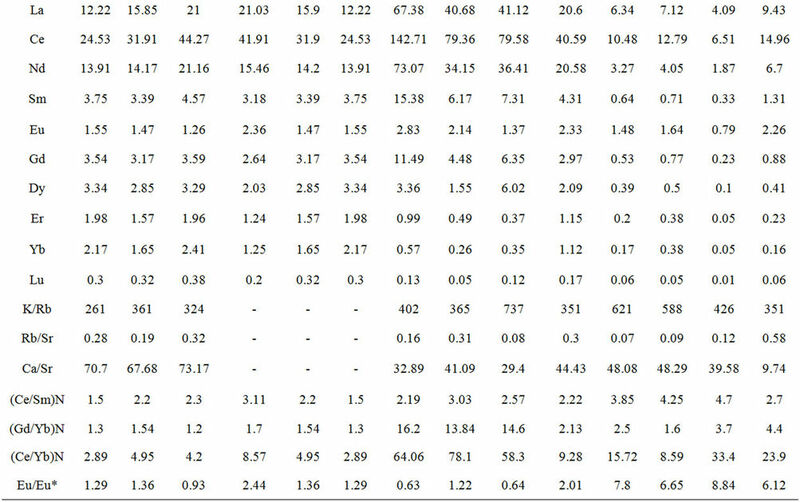 Resulting errors (1σ) are typically 1.0%, 0.20% and 1.30% for Pb, Th and U, respectively, based on counting statistics. The lines Lα1 for La, Y, Ce; Lβ1 for Pr, Sm, Nd, Gd and Kα1 for P, Si and Ca were chosen. Orthophosphates of the Smithsonian Institution were used as standards for REE analysis [31,32]. Calibration of PbO was carried out on a vanadinite standard, while U was calibrated on an appropriate glass standard with 5 wt% UO2. The Madmon monazite , dated by SHRIMP at 489 ± 9 Ma and numerous Pb-Pb-TIMS monazite evaporation data at 497 ± 2 Ma, contains ThO2 at around 10 wt%. The ThO2 in Madmon was previously determined by LA-ICPMS and by the microprobe at University of Salzburg  and was used for calibration of ThO2 as well as for the control of data. 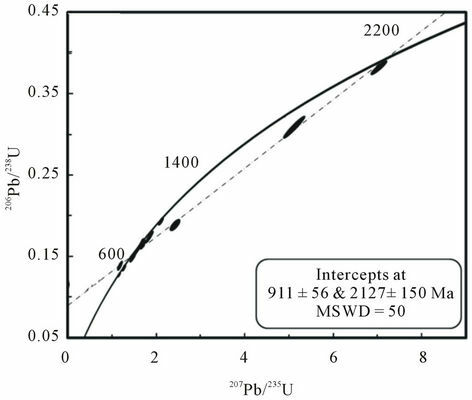 Interference of YLg on the PbM line was corrected by linear extrapolation after measuring several Pb-free yttrium glass standards as proposed by Montel et al. . An interference of ThMg on UM was also corrected by using a Th-glass standard. 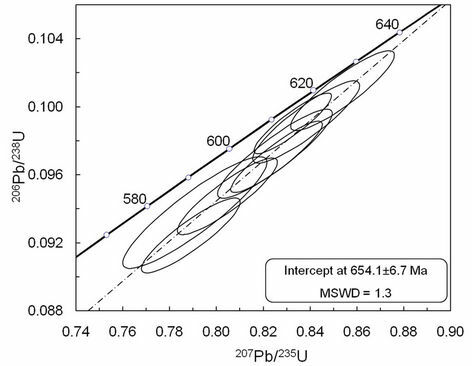 Interference of a Gd-line on UMβ needs correction when Gd2O3 in monazite is >5 wt%. These parameters matched the analytical problems discussed in  in the best way . For each single analysis, a chemical age (CHIME) and a 2σ error based on the Pb counting statistics was calculated. Other possible sources of error, as standardization, matrix effect correction, YLγ-on-PbMα correction and instrumental drift were not taken into account. Therefore the given error on the calculated ages should be considered as a minimum error. U-Pb isotopic analyses were performed in the geochronology laboratory of the University of Brasilia and followed the analytical procedure described by Buhn et al. . Zircon concentrates were extracted from ca. 10 kg rock samples using conventional gravimetric and magnetic techniques at the geochronology laboratory of the University of Brasilia. Mineral fractions were hand picked under a binocular microscope to obtain fractions of similar size shape and colour. For in situ ICP-MS analyses, hand picked zircon grains were mounted in epoxy blocks and polished to obtain a smooth surface. Backscattered electron and cathodoluminescence images were obtained using a scanning electron microscope in order to investigate the internal structures of zircon crystals prior to analysis. Before LA-ICP-MS analyses, mounts were cleaned with dilute (ca. 2%) HNO3. The samples were mounted in a specially adapted laser cell and loaded into a new Wave UP213 Nd: YAG laser (l = 213), linked to a Thermo Finnigan Neptune Multi-collector ICPMS. Helium was used as the carrier gas and mixed with argon before entering the ICP. The laser was run at a frequency of 10 Hz and energy of 34%. In order to avoid down-hole fractionation during ablation, we adopted for a raster scan of about 70 μm in total diameter with a spot size of 30 μm. Two international zircon standards were analysed throughout the U-Pb analyses. The zircon standard GJ-1  was used as the primary standard in a standardsample bracketing method, accounting for mass bias and drift correction. 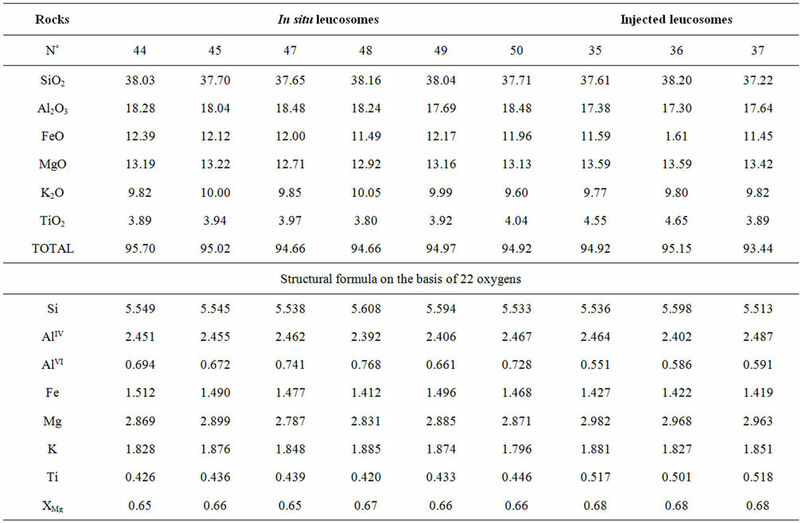 The resulting correction factor for each sample analysis considers the relative position of each analysis within the sequence of 4 samples bracketed by two standard and two blank analyses each . The Temora 2 standard  was run at the start and the end of each analytical session, yielding an accuracy around 2% and a precision in the range of 1%. The errors of sample analyses were propagated by quadratic addition of the external uncertainty observed for the standards to the reproducibility and within run precision off each unknown analysis. The instrumental set-up and further details of the analytical method applied are given by Buhn et al. . The masses 204, 206 and 207 are measured with ion counters, and 238U was analyzed on a Faraday cup. The signal of 202Hg was monitored on an ion counter for correction of the isobaric interference between 204Hg and 204Pb. The signals during ablation were taken in 40 cycles of 1 sec each. For data evaluation, only coherent intervals of signal response were considered. 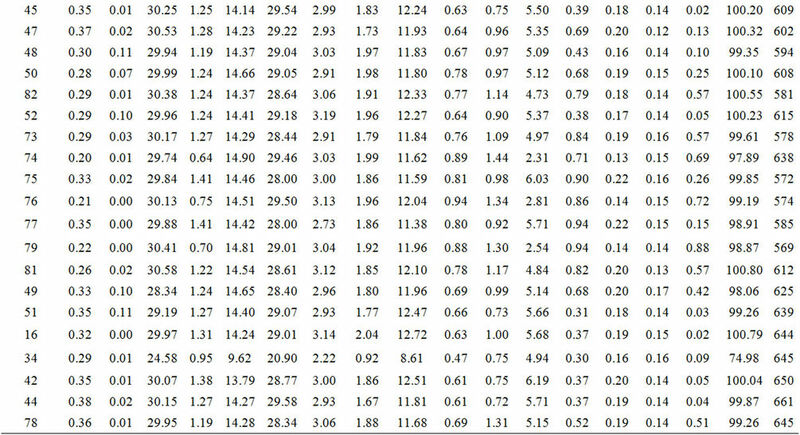 Data reduction was performed with an Excel spreadsheet developed by one of the authors that considers blank values, zircon standards composition and errors propagation. The 204Pb signal intensity was calculated and corrected using a natural 202Hg/204Hg ratio of 4.346. A common Pb correction was applied for zircons with 206Pb/204Pb lower than 1000, applying a common lead composition following the Stacey and Kramers model . Plotting of U-Pb data was performed by ISOPLOT v.3  and errors for isotopic ratios are presented at the 2σ level. Because of the statistical treatment applied in calculating Concordia ages, those are more precise than any individual U/Pb or Pb/Pb ages  and, in data herein presented, always correspond to less than the 2% accuracy obtained from the intercalibration of the standards. 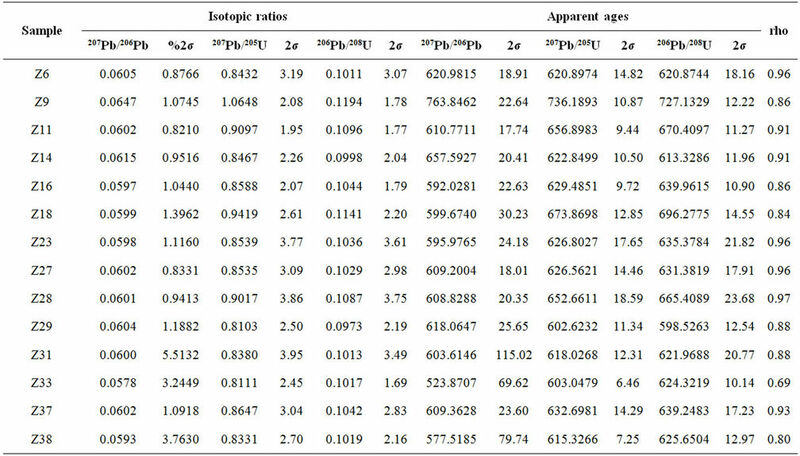 Consequently, the Isoplot calculated errors were modified in order to incorporate this uncertainty level and, hence, represent a more realistic age in terms of the analytical limitations of the method. Figure 3. Field occurrences of injected leucosomes (a) and in situ leucosomes (c), and detail of microstructure of injected leucosomes (b) and in situ leucosomes (d). ii) coarse-grained, mainly composed of ribbons or interstitial quartz (25% - 40%), plagioclase, K-feldspar and biotite. Plagioclase (10% - 45%; An17-An18) occurs as euhedral antiperthitic crystals with deformed twins and sometimes as porphyroblasts with inclusions of quartz and biotite flakes. K-feldspar (10% - 50%) occurs as large crystals and is often perthitic (Or95 Ab5-Or86 Ab14). Biotite (<2%) is of magnesian composition (XMg: 0.62 - 0.67, Table 2; Figure 5) and occurs as flakes of various dimensions, most of which contain small inclusions of zircon and apatite. Accessories are monazite, zircon, apatite and often sillimanite, calcite, tourmaline and muscovite. Figure 4. Triangular diagram showing the nature of garnet in Yaoundé leucosomes. Table 1. Electron microprobe data of garnet from Yaoundé leucosomes. Table 2. Electron microprobe data of biotite from Yaoundé leucosomes. Figure 5. XFe vs AlVI diagram showing the composition of biotite in Yaoundé leucosomes. anhedral and perthitic (Or89Ab11-Or93Ab7). The perthitic composition ranges from An18Ab82 to An20Ab80. Garnets (<5%) appears as small euhedral crystals or zoned porphyroblasts (Figure 3(d)). 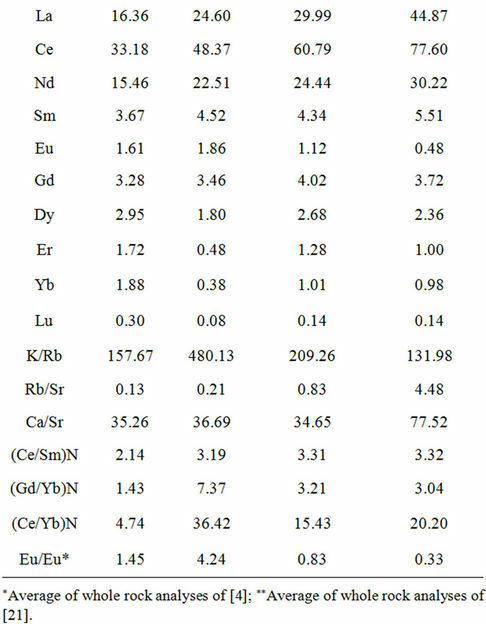 The mineral composition of garnet is given in table 1. They form a solid solution of almandine (XFe: 0.55 to 0.58) rich in pyrope (XFe = 0.33 to 0.39) and poor in spessartine (Figure 4). Biotite (≤3%) has magnesian composition (XMg = 0.65 - 0.67, Table 2) and appears as frayed flakes. Kyanite (<2%) is corroded twinned euhedral crystals (1 - 3 mm). They are often oriented or lodged between plagioclase, K-feldspar, garnet and quartz crystals (Figure 3(d)). Muscovite, monazite, zircon, rutile, apatite and oxides represent the accessory phase. In the XFe vs AlVI biotite diagram (Figure 5), there is a significant difference between in situ leucosomes and injected leucosomes. 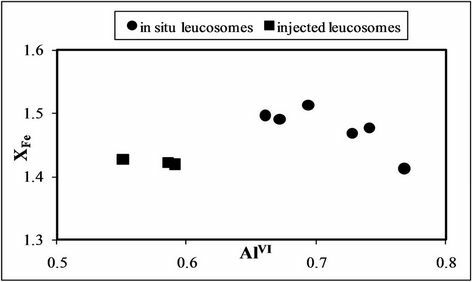 In situ leucosomes are enriched in both aluminium and iron, whereas injected leucosomes are depleted with respect to the same elements. Figure 6. Classification diagram of plutonic rocks  showing the localization of the studied leucosomes in the granite field. to shoshonitic affinities (Figure 7). In major elements variation diagrams vs SiO2 (Figure 8), the two rock types form well defined clusters, and taken together define more or less well-defined trends. 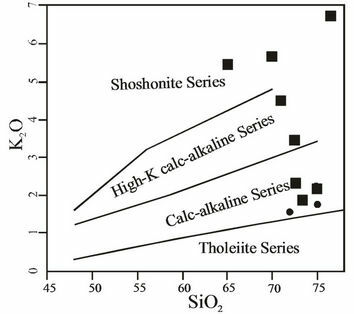 In situ leucosomes show decreasing concentration of K2O, Al2O3, MgO, TiO2 and CaO with an increase in SiO2, while injected leucosomes show decreasing concentration of Al2O3, TiO2, Fe2O3 and MgO with an increase in SiO2. 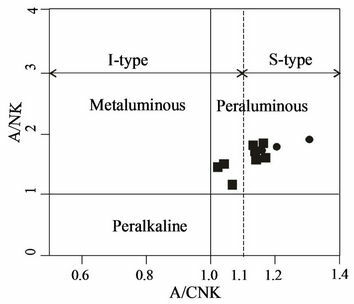 In the alumina index molar diagram (Al2O3/(CaO + Na2O + K2O) vs Al2O3/(Na2O + K2O)), all the rocks plot in peraluminous field with in situ leucosomes conform to S-type and injected leucosomes conform to S-type and I-type granitoids (Figure 9). Figure 7. 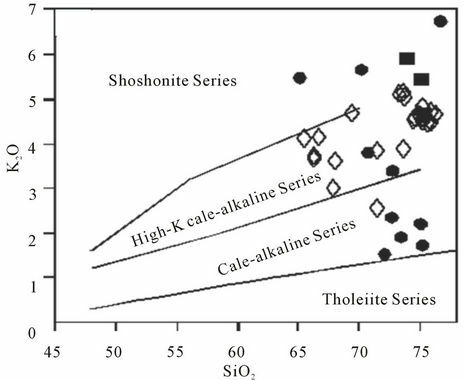 Diagram K2O vs SiO2 showing calc-alkaline, high-K to shoshonitic affinity of the Yaoundé leucosomes. Symbols as in figure 6.
enrichment (CeN/SmN = 2.19 - 4.70; Figure 11(B)). 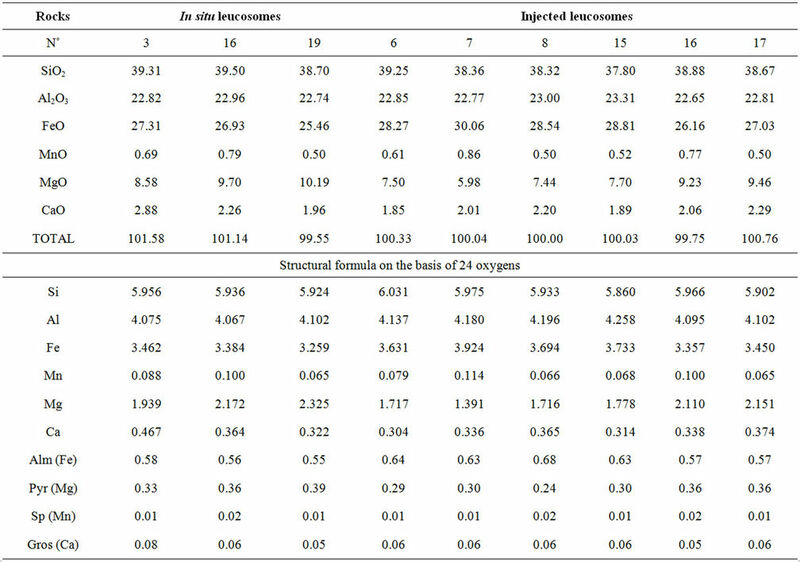 The REE patterns lead to the distinction of two groups of injected leucosomes: 1) a first group (Figure 11(Ba)) characterized by strong Eu positive anomalies (Eu/Eu* = 2.01 - 8.84) and, 2) a second group (Figure 11(Bb)) with negative to null Eu anomalies (Eu/Eu* = 0.63 - 1.22) and a strong enrichment in LREE (CeN/SmN = 2.19 - 4.70). These geochemistry behaviours are in accordance with subdivisions done in petrography. Table 3. 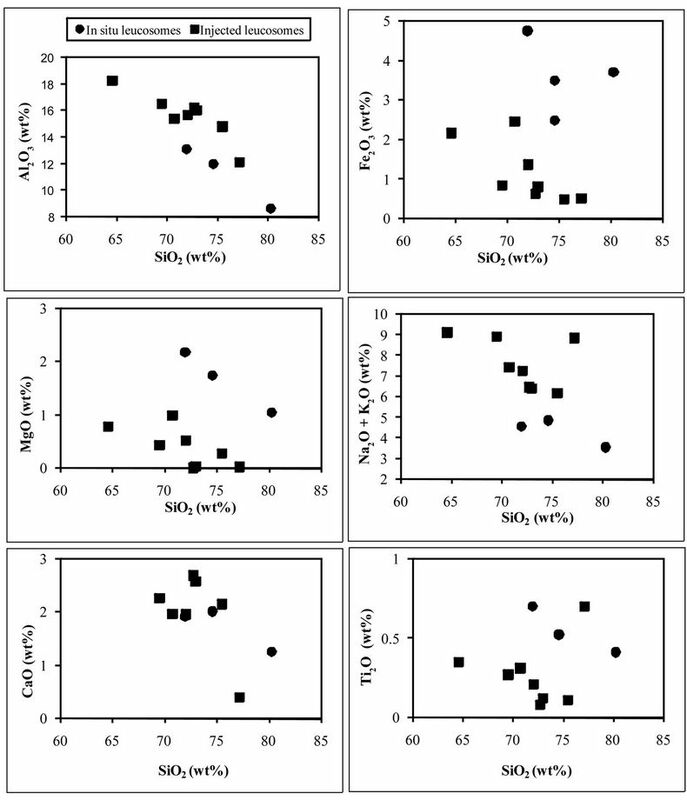 Representative major (wt%) and traces (ppm) elements analyses of the Yaoundé leucosomes. Figure 8. Harker diagrams of selected major elements. Symbols as in figure 6.
the younger generation gives 592 ± 10 Ma while it gives 658 ± 25 Ma for the older one (Figure 15(b)). These two groups of ages seem to belong to the same thermal event because the petrography study reveals that all the monazite crystals are included in biotite flakes. Statistically, all these data can be considered as belonging to the same crystal population. 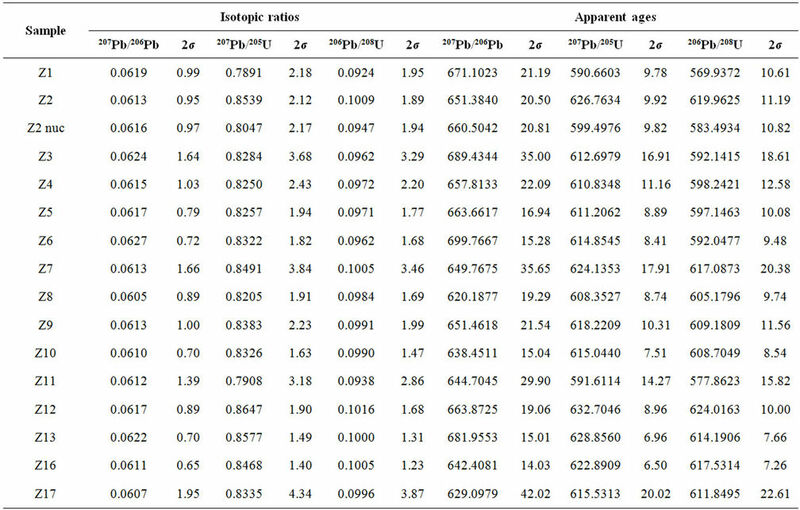 Fourteen grains of zircons from the leucosomes of metapelite were analyzed by the LA-ICP-MS method (Table 6). 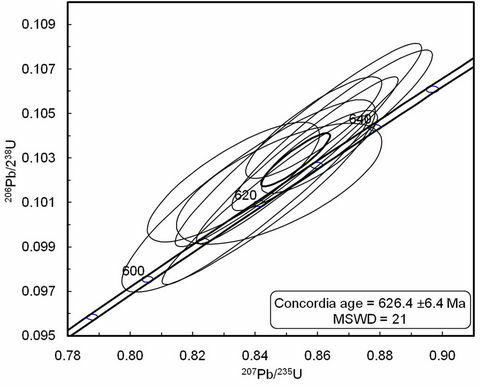 The Concordia diagrams (Figure 16) obtained reveal a concordant Pan-African age at 626 ± 6.4 Ma (MSWD = 2.1). The analyzed zircons crystals did not show any sign of a complex history. The obtained concordant ages correspond to the melting age during the Pan-African orogeny in Cameroon. 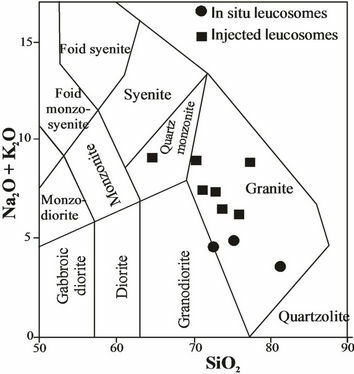 For the leucosomes occurring in metabasite, sixteen grains of zircons were analyzed by the same method. 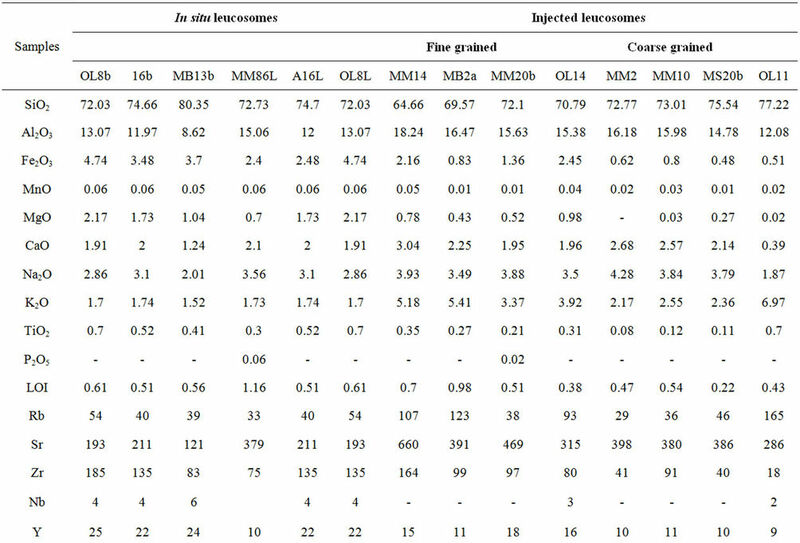 The obtained results (Table 7) define a Discordia (Figure 17) with an average Pan-African age at 654 ± 6.7 Ma (MSWD = 1.3). Table 4. 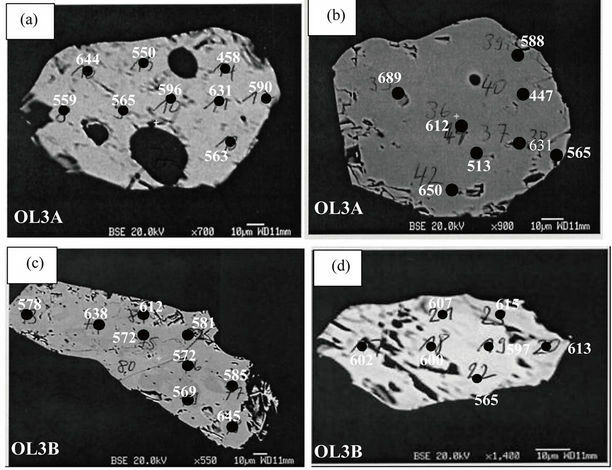 Electron microprobe analyses of monazite from Yaoundé leucosomes (sample OL3A). Monazite ages from single analyses are given with minimal error (see text). Figure 9. 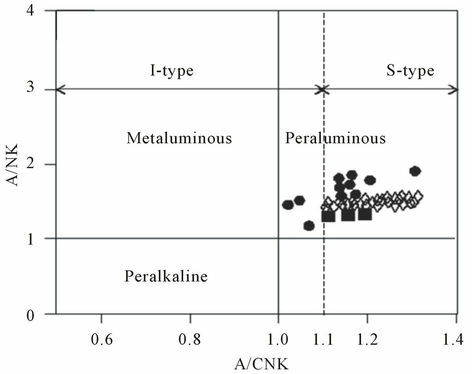 Molar A/NK vs A/CNK diagram showing the peraluminous character of Yaoundé leucosomes. Symbols as in figure 6.
with upper intercept at 2127 ± 150 Ma and the lower intercept at 911 ± 56 Ma (Figures 18(a) and (b)). This means that the metapelitic rocks (in situ leucosomes rich) of the Yaoundé series underwent Paleoproterozoic history (2127 ± 150 Ma) before the overprinting of an early Pan-African event at around 911 Ma. Zoned zircon crystals were also analyzed and their radiometric results are given in table 9. 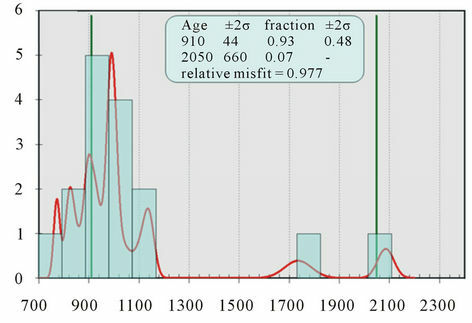 The histogram (Figure 19(a)) of zoned zircon crystals shows two groups of ages. This is confirmed in the Discordia diagram (Figure 19(b)) where the ages are discordant and define two intercepts with upper intercept at 1122 ± 110 Ma and the lower one at 620 ± 61 Ma. The 1122 Ma age of the upper intercept confirms the existence within the Yaoundé series of a metamorphic event between 1122 Ma and 911 Ma as revealed by radiometric data of no zoned zircon from metapelite. The lower intercept age (620 ± 61 Ma) is similar to the age previously obtained on no zoned zircons of metapelitic rock (626 ± 6 Ma; Figure 16) and probably corresponds to the melting age. The Tonien-Stenien event (911 - 1122 Ma) is new in the Yaoundé series and in the Pan-African North-Equatorial Fold Belt in general. This period can be interpreted as the beginning of metamorphism in the Yaoundé series. Figure 10. Harker diagrams of selected trace elements. Symbols as in figure 6. Figure 11. Chondrite-normalized REE patterns (the normalising values are from Jahn et al., 1978) for in situ leucosomes (a) and injected leucosomes (b). deformed and metamorphosed rocks of the orogenic belt (along faults and shear zones) or occurs as syn to post-tectonic plutons [47-49]. Three main models have been proposed to explain the formation of peraluminous granitoids: 1) partial melting of quartzo-feldspathic orthogneisses ; 2) reaction between basaltic melts and crustal rocks ; and 3) the spatial association and the presence of metasedimentary enclaves in the leucogranites suggesting an origin from partial melts of metasedimentary rocks [13,52,53]. Table 5. Electron microprobe analyses of monazite from Yaoundé leucosomes (sample OL3B). Monazite ages from single analyses are given with minimal error (see text). Figure 12. Backscattered electron images of selected dated monazite crystals in Yaoundé leucosomes: (a) and (b) Globular shape crystals; (c) and (d) Prismatic crystals. Table 6. LA-ICP-MS U-Pb results for zircons from leucosomes in metapelite of the Yaoundé series. Figure 13. 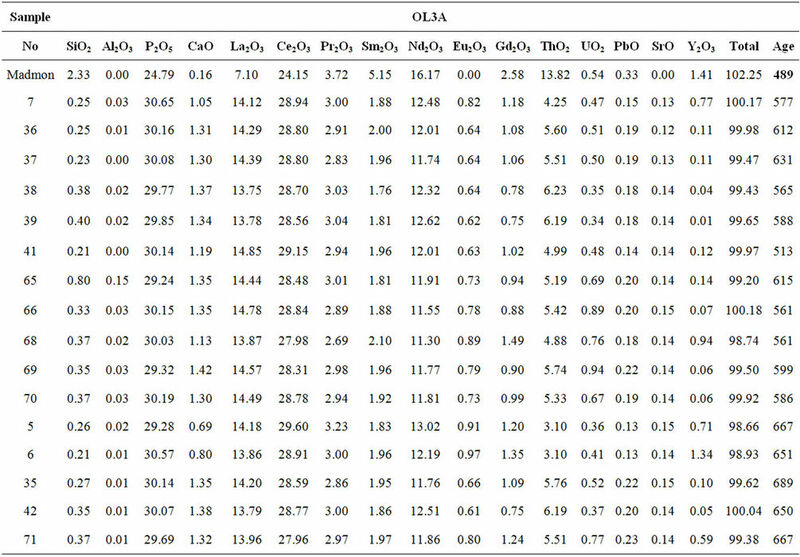 Mineral chemistry of monazites vs Th-U-Pb chemical ages of sample OL3A. (a) Y2O3 of monazites vs age; (b) ThO2 of monazite vs age; (c) UO2 of monazites vs age. Figure 14. 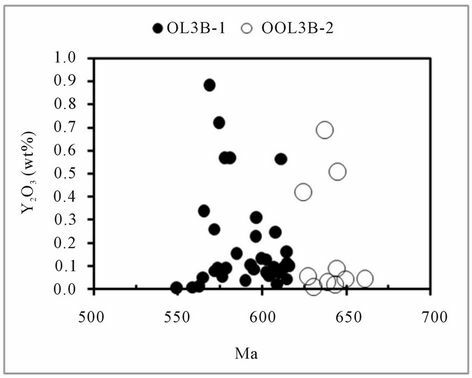 Mineral chemistry of monazites vs Th-U-Pb chemical ages of sample OL3B. (a) Y2O3 of monazites vs age; (b) ThO2 of monazite vs age; (c) UO2 of monazites vs age. Figure 15. (a) Th-U-Pb CHIME model ages for Yaoundé leucosomes. Total PbO vs (wt%) isochron diagram; = ThO2 + UO2 equivalents expressed as ThO2, after . 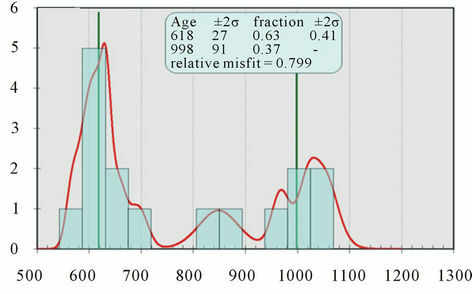 Isochron age derived from these diagrams broadly match weighted average ages calculated for the rocks according to ; (b) Histogram view of EMP-Th-U-Pb monazite ages. Table 7. LA-ICP-MS U-Pb results for zircons from leucosomes in metabasite of the Yaoundé series. Table 8. LA-ICP-MS U-Pb results for no zoned zircons from leucosomes in metapelite of the Yaoundé series. Table 9. LA-ICP-MS U-Pb results for zoned zircons from leucosomes in metapelite of the Yaoundé series. Figure 16. U-Pb Concordia diagram ages for zircons from leucosomes in metapelite of the Yaoundé series. Figure 17. U-Pb Discordia diagram for zircons from leucosomes in metabasite of the Yaoundé series. from melting of metagreywacke. The difference between the two types of leucosomes could be linked to the difference in the composition of their source and the probable contamination during transportation of the melting material (displacement and injection of magmatic liquids). Thus the melting phenomenon observed in the Yaoundé series has not only affected the metapelitic rocks of this series but also the metagreywacke of the upper part of the crust as proposed in the other domains of the PANEFB. 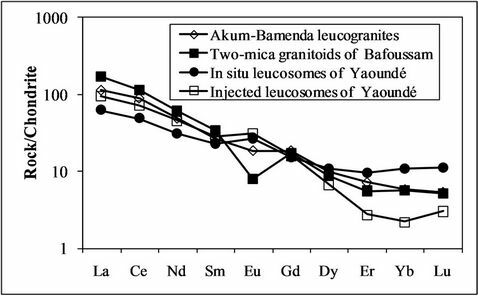 The proposed source for the leucosome of theYaoundé series is similar to that for the AkumBamenda leucogranites  and for the two-mica granitoids of Bafoussam area . Figure 18. 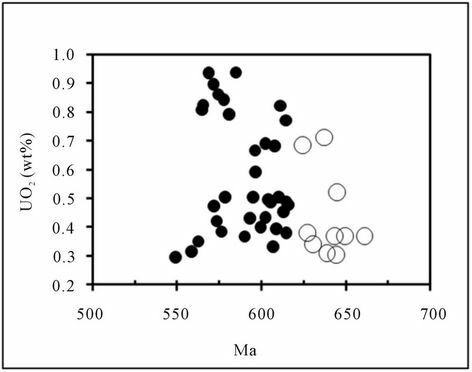 (a) Histogram of ages showing the different thermal event recorded by zoned zircons from leucosomes in metapelite of the Yaoundé series; (b) U-Pb Discordia diagram ages for these zircons. Figure 19. 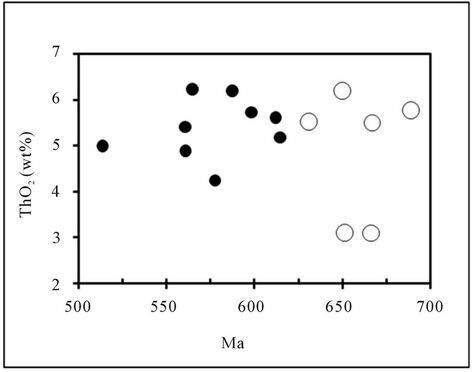 (a) Histogram showing the different thermal event recorded by no zoned from leucosomes in metapelite of the Yaoundé series; (b) U-Pb Discordia diagram ages for these zircons. Figure 20. 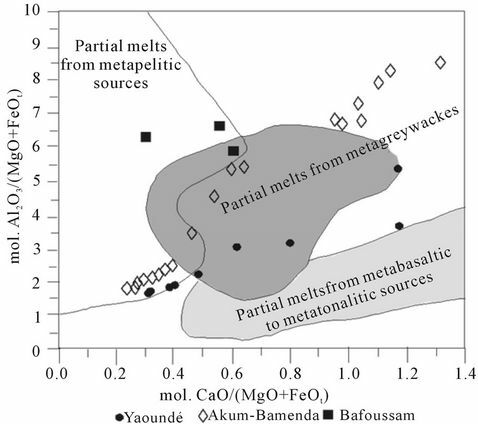 Molar CaO/(MgO + FeOt) vs Al2O3/(MgO + FeOt) diagram showing the same sources for Yaoundé leucosomes, Akum-Bamenda leucogranites and two-micas granitoids of Bafoussam. Figure 21. 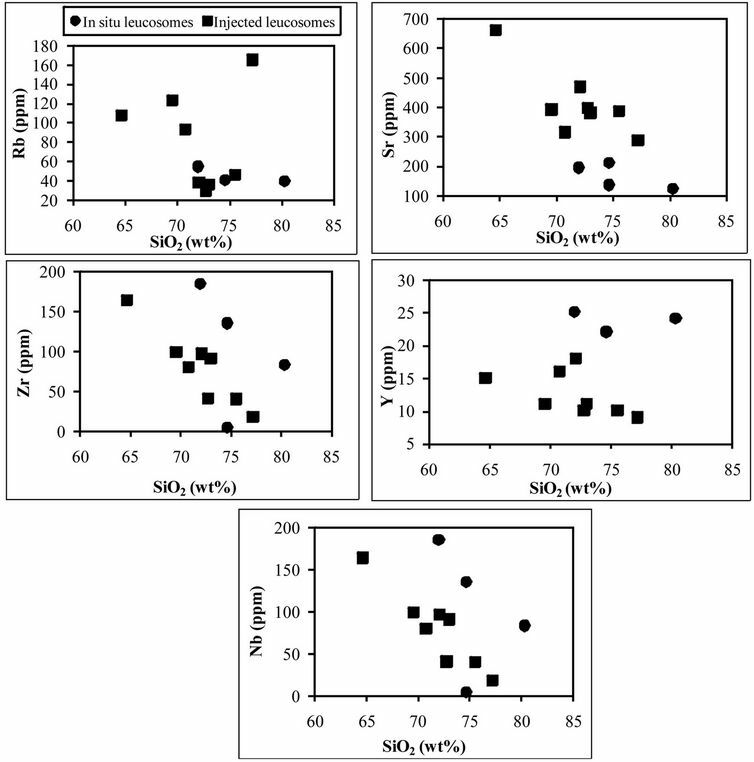 SiO2 vs K2O (a) and molar A/NK vs A/CNK (b) diagrams showing the same calc-alkaline, high-K to shoshonitic affinity, peraluminous character of the Yaoundé leucosomes, Akum-Bamenda leucogranites and two-micas granitoids of Bafoussam. Table 10. 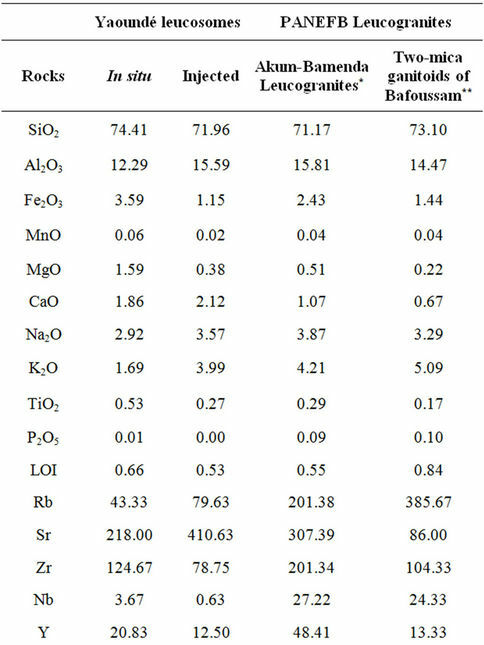 Compared average chemical analyses of the Yaoundé leucosomes, Akum-Bamenda leucogranite and twomicas granitoids of Bafoussam. Figure 22. Chondrite-normalized REE comparison patterns for the Yaoundé leucosomes, Akum-Bamenda leucogranites and two-micas granitoids of Bafoussam. Bafoussam. 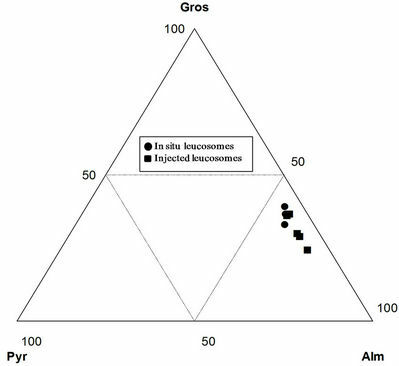 The REE patterns also show positive Eu anomalies for the Yaoundé leucosomes and negative to null Eu anomalies for the Akum-Bamenda leucogranites and the two-mica granitoids of Bafoussam. This contrasting Eu behaviour can be attributed to the difference in the geodynamic setting (tectono-metamorphic context in Yaoundé and tectono-magmatic context in the other domain of the PANEFB) of the emplacement of these granitoids. The Palaeoproterozoic protolith (2127 Ma) of Yaoundé series underwent metamorphism between 1122 and 911 Ma. 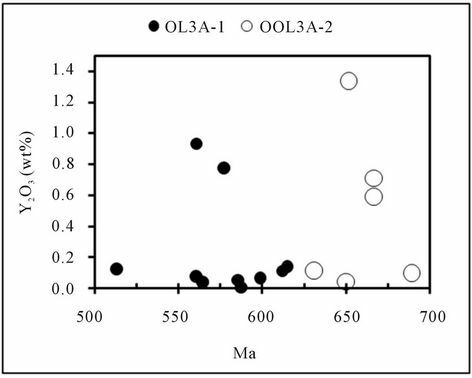 The Nd isotopic signature confirms the presence of late Paleoproterozoic to Archean relics in the central domain of the PANEFB [3,19,20,64-66]. In the SE of Tibati-Banyo shear zone, Pan-African granitoids derived from melting of a Paleoproterozoic crust with low participation of juvenile magma [3,18,62,66,67]. These observations confirm the initial existence of Paleoproterozoic formations in the three domains of the PANEFB in Cameroon. 3) In the eastern Cameroon, with the continental magmatism responsible for the emplacement of PanAfrican (614 ± 41 Ma) peraluminous granite and diorite, orthogneisses at 621 ± 13 Ma . These orthogneisses are very abundant at the Cameroon-Central African Republic boundary. 3) The existence of two sources (metapelite and metagreywacke sources) for the peraluminous granitoids of the PANEFB. All these interpretations allow us to propose, in addition to metamorphism and tectonics, the existence of a unique magmatic event along the entire PANEFB in Cameroon. 1) The Yaoundé series is composed of metasediment and metabasite which have been metamorphosed during Tonien-Stenien (911 - 1127 Ma) period. 2) These rocks have been affected by a melting responsible for the S-type and I-type peraluminous leucosomes emplacement. These leucosomes are calc-alkaline, high-K to shoshonitic affinity similar to the other granitoids of the PANEFB. 3) Geochemical data reveal that in situ leucosomes derived from the melting of the host metapelite whereas injected leucosomes derived from the melting of metagreywacke. These sources are similar to those of granitoids from central and northern domains of the PANEFB. 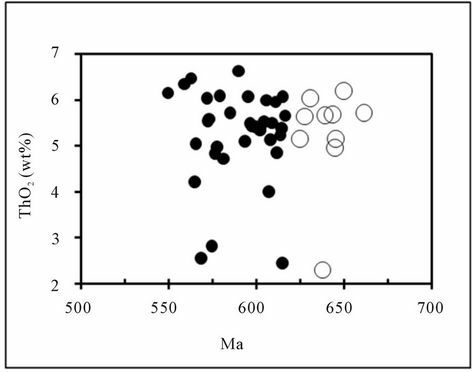 4) The melting responsible for the genesis of leucosomes in the Yaoundé series took place between 592 and 658 Ma as the magmatism responsible for the emplacement of granitoids in the other domains the PANEFB. 5) There is therefore uniqueness of melting and magmatism all over the PANEFB as the uniqueness observed in metamorphic and tectonic aspects. The authors thank the Institute für Minerologie of University of Freiberg (Germany) and the Laboratory of Geochronology of the University of Brasilia (Brazil) for providing many facilities for EMP monazite dating and LA-ICP-MS U-Pb dating respectively. This is a contribution to IGCP project 616. M. Pichavent, D. J. Kontak, L. Briqueu, J. V. Herrera and A. H. Clark, “The Miocene-Pliocene Macusani Volcanic, SE Peru. II. Geochemistry and Origin of a Peraluminous Magma,” Contribution to Mineralogy and Petrology, Vol. 100, No. 3, 1988, pp. 325-338. M. Pichavent, D. J. Kontak, J. V. Herrera and A. H. Clark, “The Miocene-Pliocene Macusani Volcanic, SE Peru I. Mineralogy and Magmatic Evolution of a Two Mica Aluminosilicate Bearing Ignimbrite Suite,” Contribution to Mineralogy and Petrology, Vol. 100, No. 3, 1988, pp. 300-324. J. P. Nzenti, E. L. T. Njiosseu and A. N. Nchare, “The Metamorphic Evolution of the Palaeoproterozoic High Grade Banyo Gneisses (Adamawa, Cameroon, Central Africa),” Journal of the Cameroon Academy of Sciences, Vol. 7, No. 2, 2007, pp. 95-109. D. T. Tchato, B. Schulz and J. P. Nzenti, “Electron Microprobe (EMP) Monazite Dating and P-T Data of the Neoproterozoic Metamorphic and Mylonitic Events in the Kekem Area, Cameroon North Equatorial Fold Belt,” Neues Jahbur of Paleontology, Vol. 186, No. 1, 2009, pp. 95-109. 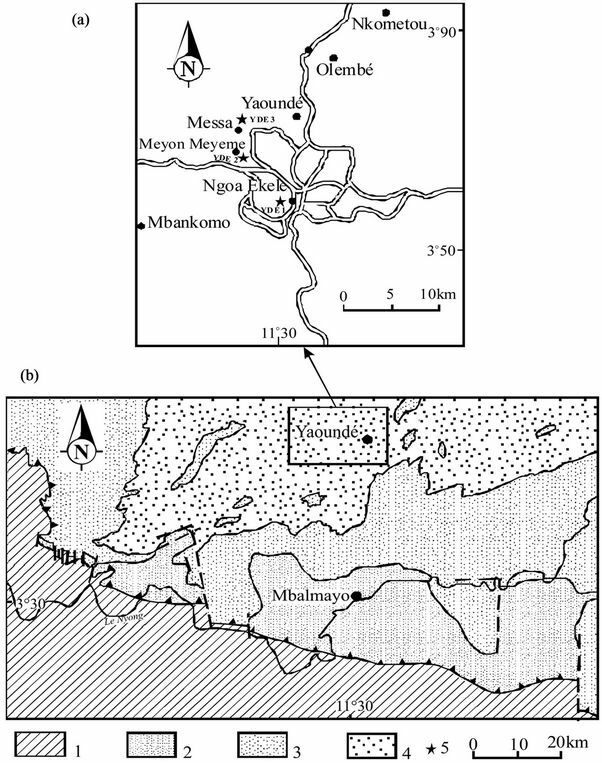 T. Ngnotué, J. P. Nzenti, P. Barbey and F. M. Tchoua, “The Ntui-Betamba High Grade Gneisse: A Northward Extension of the Pan-African Yaoundé Gneisses in Cameroon,” Journal of African Earth Sciences, Vol. 31, No. 2, 2000, pp. 369-381. J. P. Nzenti, P. Barbey, P. Jegouzo and C. Moreau, “Un Nouvel Exemple de Ceinture Granulitique dans une Chaîne Protérozoïque de Transition: Les Migmatites de Yaoundé au Cameroun,” Compte Rendu Académie des Sciences de Paris, Vol. 299, No. 17, 1984, pp. 1197-1199. J. Penaye, S. F. Toteu, W. R. Van Schmus and J. P. Nzenti, “U-Pb and Sm-Nd Preliminary Geochronology Data on the Yaoundé Series, Cameroon: Re-Interpretation of the Granulitic Rocks as the Suture of Collision in the ‘Centrafrican’ Belt,” Comptes Rendus de l’Académie des Sciences de Paris, Vol. 317, No. 2, 1993, pp. 789-794. J. P. Nzenti, “Pétrogenèse des Migmatites de Yaoundé (Cameroun): Eléments pour un Modèle Géodynamique de la Chaîne Panafricaine Nord-Equatoriale,” These Doctorat, University of Nancy I, Nancy, 1987. P. Barbey, J. Macaudière and J. P. Nzenti, “High-Pressure Dehydration Melting of Metapelites: Evidence from Migmatites of Yaoundé (Cameroon),” Journal of Petrology, Vol. 31, No. 2, 1990, pp. 401-428. V. Ngako, “Evolution Métamorphique et Structurale de la Bordure Sud-Ouest de la ‘Série de Poli’, Segment Camerounais de la Chaîne Panafricaine,” Mémoire et documents du C.A.E.S.S., Vol. 5, 1986, 185 p.
J. Penaye, S. F. Toteu, A. Michard, J. M. Bertrand and D. Dautel, “Reliques Granulitiques d’Age Protérozoïque Inférieur dans la Zone Mobile Panafricaine d’Afrique Centrale au Cameroun: Géochronologie U-Pb sur Zircons,” Comptes Rendus de l’Académie des Sciences de Paris, Vol. 309, No. 2A, 1989, pp. 315-318. J. P. Nzenti, P. Barbey and F. M. Tchoua, “Evolution Crustale au Cameroun: Eléments pour un Modèle Géodynamique de l’Orogenèse Néoprotérozoïque,” In: J.-P. Vicat and P. Bilong, Eds., Géologie et Environments au Cameroun, GEOCAM, Vol. 2, 1999, pp. 397-407. G. D. K. Nono, J. P. Nzenti, C. E. Suh and S. Ganno, “Geochemistry of Ferriferous, High-K Calc-Alkaline Granitoids from Banefo-Mvoutsaha Massif (NE Bafoussam), Central Domain of the Pan-African Fold Belt, Cameroon,” The Open Geology Journal, Vol. 4, No. 1, 2010, pp. 21-34. A. N. Nchare, J. P. Nzenti, E. L. T. Njiosseu, S. Ganno and T. Ngnotué, “Synkinematic Ferro-Potassic Magmatism from the Mekwene-Njimafofire Foumban Massif, along the Foumban-Banyo Shear Zone in Central Domain of Cameroon Pan-African Fold Belt,” Journal of Geology and Mining Research, Vol. 2, No. 6, 2010, pp. 142-158. D. Soba, A. Michard, S. F. Toteu, D. I. Norman, J. Penaye, V. Ngako, J. P. Nzenti and D. Dautel, “Données Géochronologiques Nouvelles (Rb-Sr, U-Pb et Sm-Nd) sur la Zone Mobile Panafricaine de l’Est-Cameroun: Age Protérozoique Supérieur de la Série de Lom,” Comptes Rendus de l’Académie des Sciences de Paris, Vol. 312, No. 2, 1991, pp. 1453-1458. B. Schulz, H. Brätz, K. Bombach and E. Krenn, “In situ Th-Pb Dating of Monazite by 266 nm Laser Ablation and ICP-MS with a Single Collector, and Its Control by EMP Analysis-Z. Angew,” Geology, Vol. 35, No. 4, 2007, pp. 377-392. K. R. Ludwig, “Users Manual for Isoplot/Ex rev. 2.49. A Geochronological Toolkit for Microsoft Excel,” Berkeley Geochronology Center Special Publication, Vol. 1a, 2001, pp. 1-55. K. R. Ludwig, “User’s Manual for Isoplot/Ex v. 3.00. 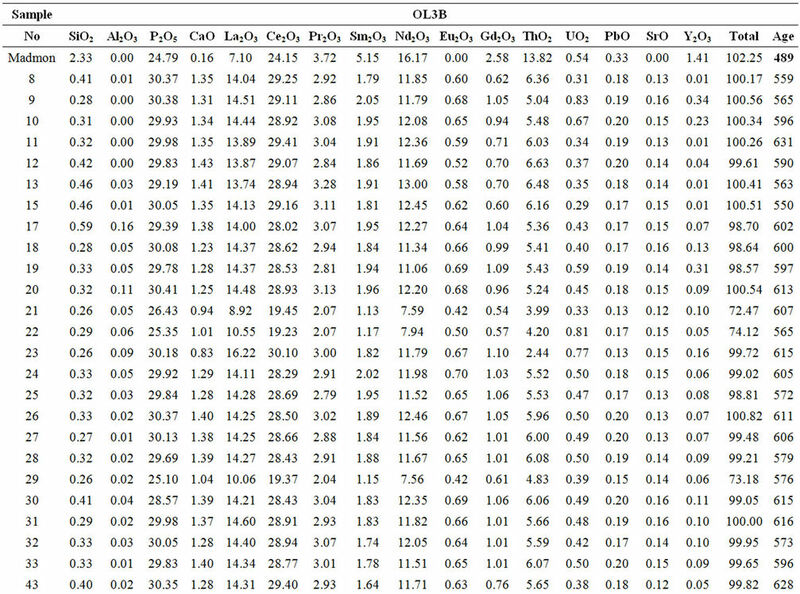 A Geochronological Toolkit for Microsoft Excel,” BGC Special Publication, Vol. 4, No. 1, 2003, pp. 1-71. E. A. K. Middlemost, “Magmas and Magmatic Rocks,” Longman, London, 1985. A. E. P. Douce, “Experimental Generation of Hybrid Silicic Melts by Reaction of High Al Basalt with Metamorphic Rocks,” Journal of Geophysical Research, Vol. 100, No. B8, 1995, pp. 623-639. C. Nzolang, H. Kagami, J. P. Nzenti and F. Holz, “Geochemistry and Preliminary Sr-Nd Isotopic Data on the Neoproterozoic Granitoids from the Bantoum Area, West Cameroon: Evidence for a Derivation from a Paleoproterozoic to Archean Crust,” Polar Geoscience, Vol. 16, 2003, pp. 196-226. J. P. Nzenti, P. Barbey, J. M. Bertrand and J. Macaudière, “La Chaîne Panafricaine au Cameroun: Cherchons Suture et Modèle!” 15th Réunion des Sciences de la Terre, Nancy, 26-28 April 1994. A. 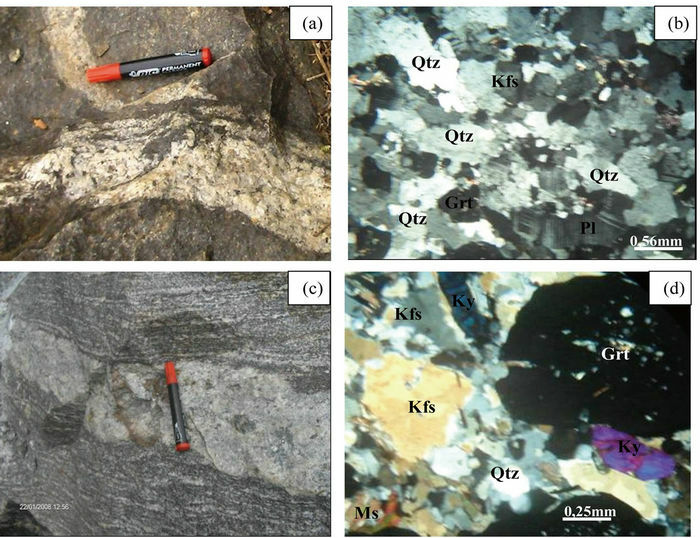 A. Ganwa, W. Siebel, C. K. Shang, N. Seguem and G. E. Ekodeck, “New Constraints from Pb-Evaporation Zircon Ages of the Méiganga Amphibole-Biotite Gneiss, Central Cameroon, on Proterozoic Crustal Evolution,” International Journal of Geosciences, Vol. 2, No. 2, 2011, pp. 138-147.